Original Dread Zeppelin guitarist Carl Jah has a new solo album, and I recently got a chance to speak with him about it for the Toledo Free Press. You can check it out here. My Periodic Table of U.S. Presidents got a mention from the fun magazine mental_floss, which lists it alongside eight other parody periodic tables, including a Periodic Table of The Empire Strikes Back Elements, a periodic table of cupcakes and a periodic table of Minecraft, among others. An alert reader noticed that two of the presidents shared the same “symbol,” so I’ve fixed that and updated the Cafe Press store with the new version. 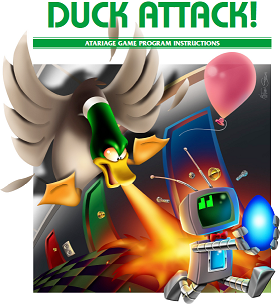 The 2600 retrogame Duck Attack! (2010) features a mallard named Bruce, and additionally a grey variant named Mandy, a gold variant named Pat, a blue variant named Groucho, and a ruddy variant named Clarice. Bruce the Duck adorns the top of the article. Other humorous Wikipedia lists mentioned include List of Premature Obituaries and List of People Who Have Been Pied. Well, the presidential election is over, which means it’s time for me to update the Periodic Table of U.S. Presidents. 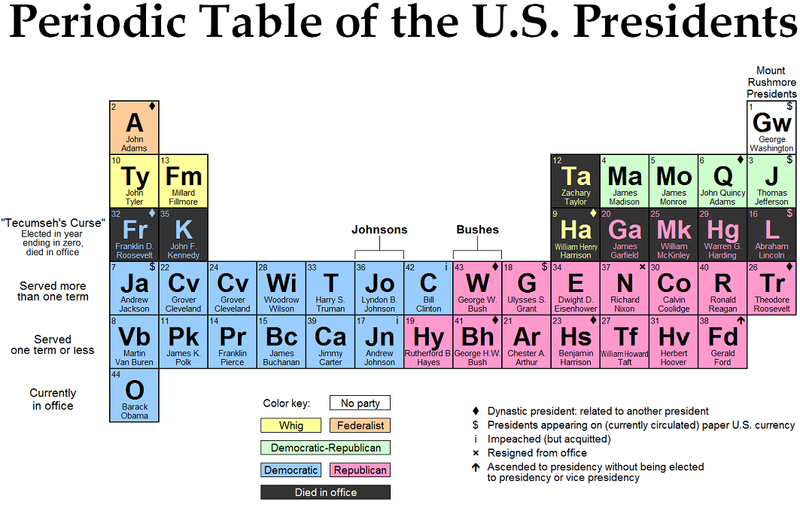 This is a whimsical but educational chart that features facts about the 44 American presidents from George Washington to Barack Obama, in the style of the famous Periodic Table of the Elements. If you’re a history buff, a political science fan, or just someone who likes colorful boxes arranged to look like sciency stuff, you might enjoy this little bit of fun. That was a nice surprise to read! Copyright © 2010–2013 Will Nicholes.